Video streaming giant Netflix (NASDAQ: NFLX) has had one heck of a run over the past five years or so. The bottom line looks like this: anyone that bought stock at the end of 2012 has seen compound returns of 73% per year to date. That’s roughly the equivalent of turning a $10,000 initial investment into $150,000 as of today. Not too shabby over a five year stretch. That said it’s hard to find many other stocks that appear so disconnected from the performance of their underlying businesses. Now, depending on who you ask Netflix falls into one of two camps. The first camp represents the extreme bears. They usually maintain the line that Netflix has a fundamentally broken business model, and that the incredible stock returns are largely a function of hype, quantitive easing and record low yields. The second camp represents the extreme bulls. They take the line that Netflix is a truly disruptive business in the mold of Google, and that the current $90 billion market-cap is fully representative of the future earnings power of the company. To get a handle on where Netflix is actually at, as well as what it has to do going forward, there are four broad questions that need to be answered. Why Is Netflix Spending So Much On Content? It’s no secret that Netflix has spent a lot of money in recent years developing its own original video content. And with the 2018 content budget scheduled to hit around $7.5 billion it doesn’t look like that trend will slow down anytime soon. Just by way of comparison HBO, arguably one of the kings of scripted television shows, has an annual content budget of ‘only’ around $2.5 billion. So why is Netflix spending such large sums building up its own exclusive library having previously been outside the production side of things? Actually this is probably where the bulls and bears will come to some kind of agreement. To understand why consider what Netflix was all about before it started developing its own shows a few years ago. Back then Netflix’s entire catalogue essentially consisted of other companies’ content. In other words it would pay license fees to the likes of 21st Century Fox, Time Warner and Disney for the right to stream their shows and films to Netflix subscribers. As a business proposition there are two fundamental problems with that. Firstly, barriers to entry are very low. It just isn’t all that difficult to set up a streaming service on the internet. Secondly, it doesn’t really scale that well even with all the growth in the world. You might add millions of subscribers each year, but eventually the content owners will simply demand higher licensing fees as a result. If they ever saw Netflix generating signifiant profit margins of off their content it wouldn’t be all that difficult for them to respond. All they’d have to do is pull their content from Netflix and set up their own individual streaming services. So with that in mind it makes prefect sense for Netflix to make its own exclusive shows. We also know that this can potentially be a lucrative business model judging by the profit margins of the big industry names mentioned above. 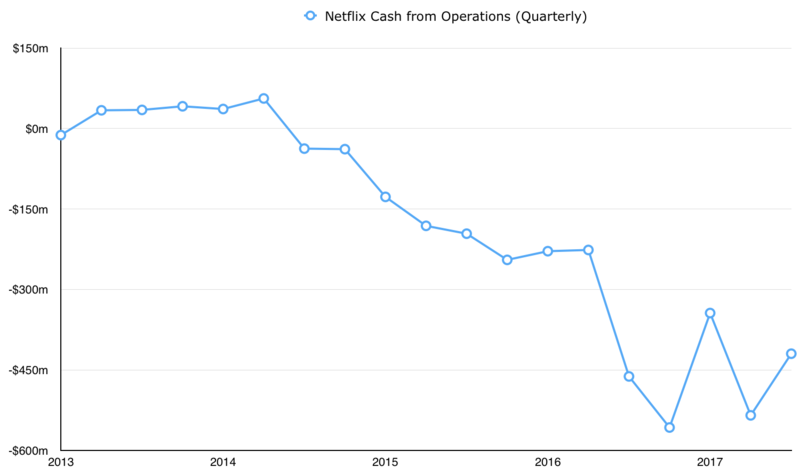 What Does Netflix Have To Do To Generate Free Cash Flow? As the content budget has grown rapidly it has had the opposite effect on the company’s cash flow position. As it stands Netflix is burning around $2 billion per year with no let up in sight. Indeed it forecasts cash flow to be negative for some years to come. Now, even the most bullish investor must concede that the company will have to produce a lot of free cash flow at some point. How will Netflix do this? Well, as you’d expect there are two broad ways. Firstly, it could try to increase its cash inflow. The most obvious way to do that would be by gaining more subscribers or increasing the monthly subscription fee. It could also try to introduce alternative revenue streams such as selling advertising or licensing its original content to other distributors. The second way would obviously be to reduce that huge content budget. Sounds fairly straightforward, but there are a myriad of potential issues that could crop up. Firstly, how would Netflix subscribers react to some of the above methods (see the next question below)? Secondly, Netflix isn’t exactly in complete control of its own destiny here. For instance, it is currently issuing debt to fill the obvious cash flow gap. It also has a very large market value which it could also use to its advantage by issuing (and then selling) richly valued shares. What happens if those avenues get cut off for whatever reason? That could be the result of interest rate hikes, a deteriorating economy hitting discretionary spending, or anything that might substantially hit Netflix’s stock price. How Sticky Are Netflix’s Subscribers? In my opinion this is the major question currently facing Netflix’s underlying business. Right now it has something like 110 million subscribers. Now as one of those subscribers I’m aware that the current service is underpriced. For £9.99 a month I’m currently getting lots of Netflix original content (much of it quite good) plus a huge content library from other creators such as Disney and Time Warner. For the consumer this represents something of a free lunch. To date Netflix bulls have pointed to its huge growth in subscribers as a sign that the business and stock is destined for great things. The problem is that gaining customers by deliberately underpricing your goods (or service in this case) isn’t the hard part. To be clear, there isn’t anything wrong with the strategy. New businesses often run loss-leaders to establish themselves and essentially buy initial customers. Similarly, already established companies might deliberately underprice one aspect of their business in order to drive sales and profits in another (e.g. Supermarket deals on certain items). The hard part is posting growth whilst making a lot of money. Coca-Cola, for example, could regularly raise prices ahead of inflation whilst still registering strong volume growth. The fact it did this for decades is the sign of a strong business. A big positive for the bulls would be if Netflix managed to do the same thing. In other words can it maintain, or even increase, its rate of subscriber growth whilst pulling off one or more of the following: inflation beating price hikes; losing content from other content creators (who will likely introduce their own streaming services); and, finally, slowing/maintaining the rate of production of its own content. How Can Netflix Justify Its Current Valuation? Ultimately we arrive at the valuation issue. After all, even if Netflix’s business manages to pull of a seamless transition to sustainable free cash flow generation, it still has to justify its current price tag. Right now Netflix trades with a market value of around $90 billion. Even if you were to attach a terminal value multiple of 20x, the business would need to make $4.5 billion or so in annual free cash flow to justify it. For context that’s roughly what Time Warner makes right now with a similar valuation. Not only that, but Time Warner has multiple avenues of profit generation. Bear in mind that this is in a bull market as well. A 20x multiple would still be rich bearing in mind how cyclical media companies tend to be. It’s understandable that a lot of folks will look at Netflix’s past shareholder returns with a bit of envy. That said it might be wise to give the stock a wide berth; at least until we can put some more positive answers to the above questions. Is Coca-Cola About To Do A McDonald’s?